Recently we featured a story about cats and wildlife, and how building a CATio, an enclosed patio just for a cat, can allow your cat fresh air, sunshine, flowers, and their own little garden without hunting and killing birds or bothering other wildlife. A CATio would protect your cat from being harmed by owls, coyotes and other predators – like bad people. Everyone loved it! 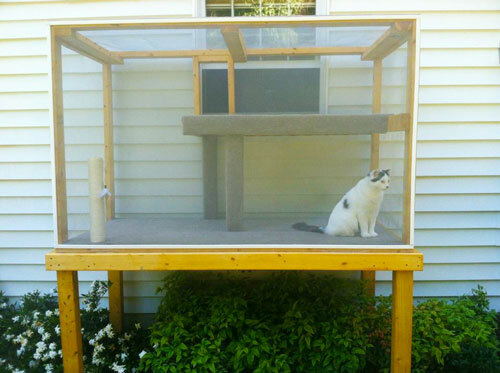 Here’s another CATio to inspire your own creative outlook outlet for your cats! You’ve got all Winter to plan it, then have it built this Spring! 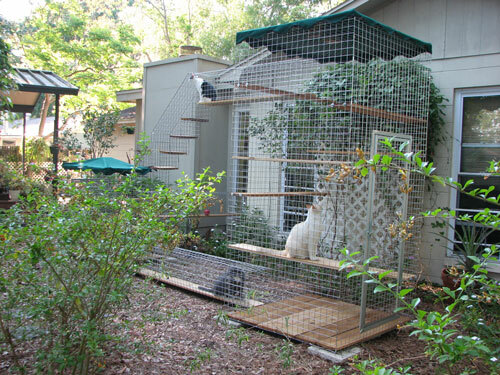 This week we feature another great example of a CATio and the happy cats who get to hang out in them! 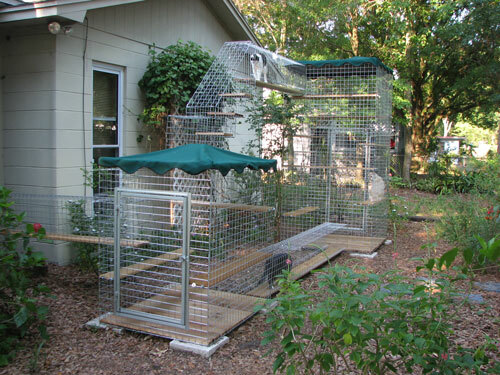 We love this CATio for a backyard that’s not very large. Notice the walkway from the window to the elevated outside enclosure so that the cat can come and go as she pleases. Jenny the cat is very happy to get nice breezes and be safely out of reach of other cats or other animals. Put a nice chair for yourself near the CATio and spend precious time with your cat outdoors! Last week we featured a story about cats and wildlife, and how building a CATio, an enclosed patio just for a cat, can allow your cat fresh air, sunshine, flowers, and their own little garden without hunting and killing birds or bothering other wildlife. A CATio would protect your cat from being harmed by owls, coyotes and other predators – like bad people. Everyone loved it! 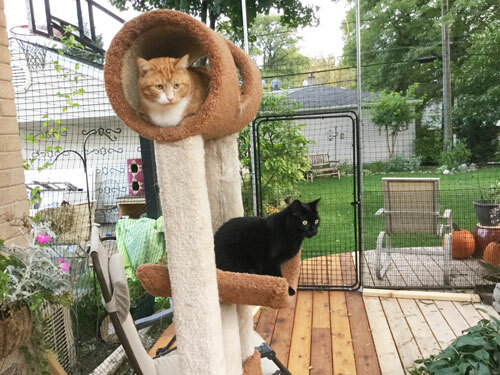 This week we feature another great example of a CATio and the happy cats who get to hang out in it! Our Malcolm is always moving, always into mischief! He loves being able to go outside and enjoy the ever-changing scenery! Here are Rudy (red kitty) and Malcom (black) enjoying their deck time. We have a Cat fence, hinged at the top, all around our deck and along the side of the house. They LOVE being out there! 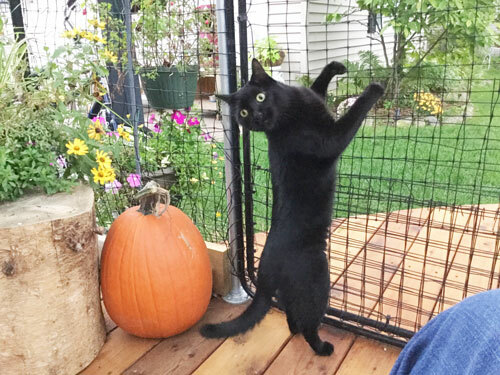 This CATio is particularly timely – black cats and pumpkins! And it’s really beautiful. A thought we’d like to add is if you already have a CATio or are planning to build one be sure that the door that leads inside is locked to keep predators of the 2-footed kind from harassing your cats! You might install an alarm to the door too. Some may want a security camera out there as well. Give your cat an outdoor CATio, save songbirds and wildlife at the same time! We’ve all read reports that outdoor cats are deadly to wildlife – in particular song birds. Usually those reports are harsh and very anti-cat, sometimes calling for the rounding up and euthanizing of ferals or cats thought to be feral. While we do not agree with such a measure outdoor cats are indeed very much a threat to song birds, migratory birds, other wild birds and small wild animals. One of the many dangers to outside cats is second-hand poisoning. If a bird or small rodent has eaten “rat poison” then your cat eats that animal you cat can die. It’s been well documented that the use of rat poison has wiped out entire families of owls and other wonderful birds, and other beneficial animals like skunks and opossums both of which eat a staggering amount of insects and small pretty, and without their presence we’d be in trouble. If you are tempted to use rat poison – don’t, you are causing multi species deaths, they are safer ways to keep rat populations down. A CATio to the rescue! Last week we asked our beloved readers and customers to submit photos of their own CATios which are specially built patios or enclosures make just for cats who want to enjoy the sunshine, a cool breeze, and the great outdoors – even if its suburban! But before you enjoy those photos we want you to read a carefully and lovingly written article from WildCare of San Rafael, CA about the CATastrophic effects of outdoor cats on wildlife and birds. The author lives with cats and loves cat deeply. Truly, it’s alarming and if you have an outdoor cat and don’t read this article and take it to heart… well, to quote an old 1960’s adage, “if you aren’t part of the solution, then you part of the problem.” Designing and implementing an outdoor CATio customized to suit your cats and your home will be a fun project, the outcome to be enjoyed by all! I grew up in an animal-loving family. Our cats were always indoor-outdoor. It’s just what you did back then. Of course my family’s cats hunted, and I can recall as a child searching the yard with my little sister for bird feathers, skulls and wings – the remnants of unfortunate victims of our cats. It never occurred to us, back then, that this was unfair to wildlife, and preventable by keeping the cats indoors. I also remember losing two cats to the traffic on the busy road behind our neighbor’s house. We would bury them in our pet and wildlife graveyard in the backyard, all of us sobbing for another beloved companion lost. Again, it never occurred to us that this was unfair to the cats, and preventable by keeping them indoors. In 1998 I started working for an animal shelter / vet clinic and wildlife rehabilitation hospital. I saw more hit-by-car, lost-a-fight-with-something now-dying-of-infected-wounds, and suffering cats, both owned and stray, than I had ever imagined. I also discovered something I had not thought about since my childhood – an endless flow of injured, maimed, orphaned wild animals caught by cats. Depending on which special interest groups fund a study, the number of killed-by-cat wildlife can vary greatly, so I will speak from what I know firsthand. At WildCare alone we treat roughly 500 wild animals a year that have been the victims of cat attacks. This number encompasses not just birds, but mammals, reptiles and amphibians as well. And these are only the animals that cat owners find alive and bring to us. Regardless of where you stand on the topic, the number of wild animals that free roaming cats kill, injure and orphan is staggering, and is putting many of our wild species at risk. Any wildlife rehabilitator can tell you how maddening and heartbreaking it is to treat or have to euthanize the never-ending flow of mangled and suffering animals that are caught by well-fed and well-loved cats year after year. Addressing this topic puts WildCare in a challenging position. We are grateful to be available to give these animals the medical care they need and the second chance they deserve, so we are thankful for the rescuers who bring them to us. We work hard to be mindful of walking the balance of not offending cat guardians because we want everyone to feel that they can bring wildlife in need of assistance to us, and we love cats too! But as wildlife advocates we must have conversations with those whose cats have caused damage (especially repeat offenders), in the hope of changing human understanding and behaviors. I wish someone had taught me about this years earlier! It is obviously a natural instinct for a cat to hunt. What is not natural is that our cats are domestic animals introduced into a wild food chain. In the wild, when a local prey population, of, say, rabbits, grows large in number, the local predator population, let’s say hawks, grows as well. More hawks may move into the area, and all the wellfed hawks have more young. 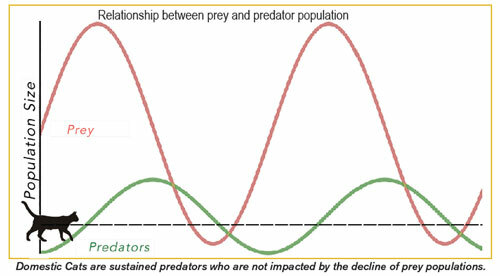 As the predator population continues to grow, they gradually reduce the prey population. With less food available, some hawks starve and die, some are forced to move out of the area in search of food elsewhere and their own breeding is not as successful. During this downswing in hawk numbers, rabbits have a chance to repopulate. The prey population recovers so well that eventually the predator population booms again. This cycle is repeated over and over. Now introduce domestic cats. Cats are housed and fed by their guardians, their every need taken care of. They can live up to 20 years in the same territory. There are multiple cats in the area and more are added every year. Nothing brings cat populations down. Cats don’t need to hunt to survive, but do it for fun. Prey animal populations never have a chance to recover. species evolving side-by-side over untold years, affecting each other in the process. Wildlife cannot evolve fast enough to respond to a domesticated species. Free-roaming cats killing wildlife is, in fact, an unfair and unnatural situation from which many species cannot recover. Another point to make about the “food chain” that is important for pet guardians to realize, is that once you allow your pet outdoors unprotected, natural or not, they have entered the food chain where not only can they hunt, but they too can be hunted. The best news regarding the topic of free-roaming cats and wildlife is that the carnage is preventable! There are many resources online to teach you how you can slowly acclimate your free-roaming cat to an indoor life and/or how you can keep an indoor cat happy and healthy. 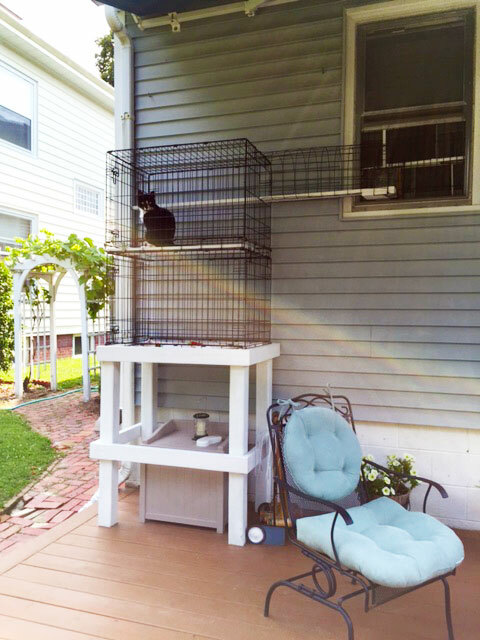 A lifetime of lessons later, my personal favorite compromise lets me keep both wildlife and my cat safe, and still offers my feline friend the fresh air and sunshine she loves – the CATIO! A catio can be any size, shape or configuration to fit your house or apartment and just about any budget. From something as simple as a window box to a screened-in patio area with multiple level pathways, your imagination is the limit. You can build your own or purchase prefab kits. There are numerous photos in this article of catios belonging to WildCare staff members and volunteers (including my own) and you can also find more ideas online. Visit wildcarebayarea.org/catio for a list of resources. And in a final note, I realize that some cats will not adjust to being kept indoors. They will yowl non-stop, shootingshooting outside at any chance. If this is your cat, then the best we can ask is that you do everything in your power to mitigate the damage that he or she can do. Utilize online resources that will teach you how to slowly acclimate an outdoor cat to an indoor life. Do not allow cats outdoors during dawn and dusk when wildlife is most active, both for your cat’s and wildlife’s safety. Harness and leash-train your cat for supervised walks. Try products such as The Cat Bib and BirdsBeSafe collars, both available in WildCare’s gift shop. Note: Bells do not work. Cats learn to walk without ringing them and fledglings who cannot fly still cannot escape, even if they hear the bell. If you see a fledgling in your yard, please keep your cat indoors for the few days this baby bird will need to learn how to fly. “If not this cat, then the next” is a great message from an amazing (if unlikely) coalition between the Audubon Society of Portland and the Feral Cat Coalition of Oregon. For those who currently have an adult cat for whom all attempts at keeping indoors have failed, we encourage you to make the pledge that the NEXT cat(s) you adopt will be indoor only. These two organizations have joined forces in an attempt to reach more people who disagree on the topic of free-roaming cats and their impact on wildlife. By bringing together both cats and wildlife lovers, they hope that more people will be open to conversations and suggestions from both sides, which is what WildCare strives for as well. More CATios in upcoming newsletters! Send us yours! Last week we asked you to send us pictures of your CATio. We heard from many innovative people and received their wonderful CATio photos – the first of which is shown in this newsletter with the others to come in a new feature called “CATio of the Week.” As we promised last week, the people who submitted their submissions before October 7th will get 4 cat toys – we won’t be able to do that again, but YOUR CATio will be seen, praised, and admired by thousands of fans and friends! So don’t feel bad if you didn’t get a chance to send in your photo the first time around, there’s much more time do so. Send your CATio photos to catfaeries@catfaeries.com to inspire our readers. We ask that you use this in the subject line so we can keep track of the photos: “My CATio” – the pictures should be at least 640×480 and included as email attachments (rather than embedded in the body of the email). Do you professionally build CATios? We want to see them too and we’ll link to your website! Be sure to put MyCATio in the subject line. 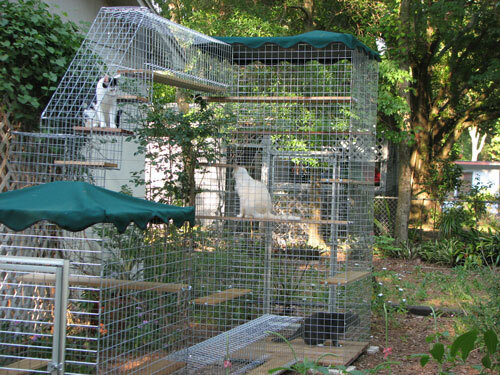 Our first CATio of the Week comes from Pat, owner of owner of Kitten Sittin’ (http://www.kittensittin.biz/) in Tampa, FL.